Brrr. Its definitely getting chilly around these parts. I'm already missing those unseasonably warm days we had last weekend. How about you? Those kind people at Para Paints offered to supply me some paint so I jumped at the chance to tackle a long standing project before the temperatures dropped. We bought two of these desk chairs long ago at HomeSense and always intended to paint them white to go into the home office. First, HandyMan took them apart and sanded them down to take off the shiny finish. 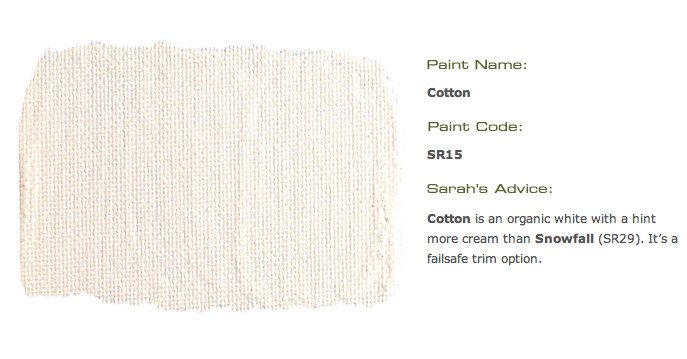 We were eager to try out Para's new low VOC "Ultra" line of paint. Touted as "a new line of Advanced Hybrid Technology waterborne/alkyd enamel paints that provides the ultimate durability and performance of oil based paints, with the convenience of water clean-up and fast dry of latex", it sounded like the perfect paint to try out on furniture. HandyMan sprayed the chairs in our homemade paint booth in the garage. Can I tell you how much I love having a spray gun and air compressor? It seriously makes our painting projects look more professional and go so much faster. I picked the colour Cotton SR15 from the Sarah Richardson Designer Palette, a nice slightly creamy white. HandyMan sprayed on several thin coats of paint followed by a coat of water based varathane. The paint was AWESOME. There was no odor, it went on smoothly and cleanup was a breeze. Wooden chairs can be hard to sit on after a while so I needed to do something to fix up the ratty old seat cushions. I had a yard of Flatiron Yellow fabric from Tonic Living lying around and whipped out the sewing machine to make some new seat covers. I also sewed up some leg warmers / tube socks / fingerless glove thingys for my chairs. Uhm, what?? Well, the chairs are hydraulic and when you lift them up, sometimes the arms scrape the underside of the desk and the finish wears off. So I made these tube things to protect the arms. Yes, I baby my furniture (not to mention HandyMan would kill me if I scratched up that new paint job). They really brighten up the room and I'm glad to finally check this one off the To Do list! Did you work on any projects this weekend? Update: If you want to just buy a chair and have it together within minutes a great selection of office chairs are available to buy online from Viking Direct, visit Viking at Viking-direct.co.uk.